It was a brief rally, which came to an abrupt end this week, as lamb markets crashed across the east coast this week, except in the west. It was a supply driven slump, and sheep markets joined in, also tanking. It would seem we have seen the last of prices with a 6 in front for a while, but weather could have a say in the short term. The last of the strong prices for 2017 seems to have drawn out the last of the old season lambs this week. 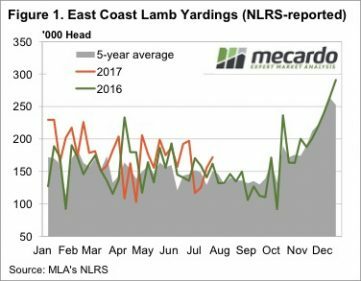 Figure 1 shows a sharp jump in lamb yardings this over the last two weeks, with nearly 172,000 head yarded this week. Given the lower slaughter space on offer at the moment, it was enough to send prices sharply lower. 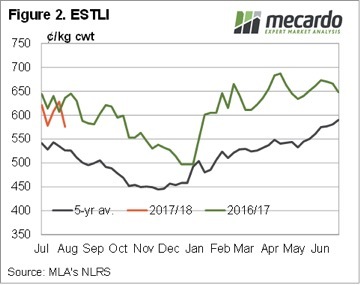 Figure 2 shows the ESTLI falling back to its recent lows, finishing Thursday at 576¢/kg cwt. 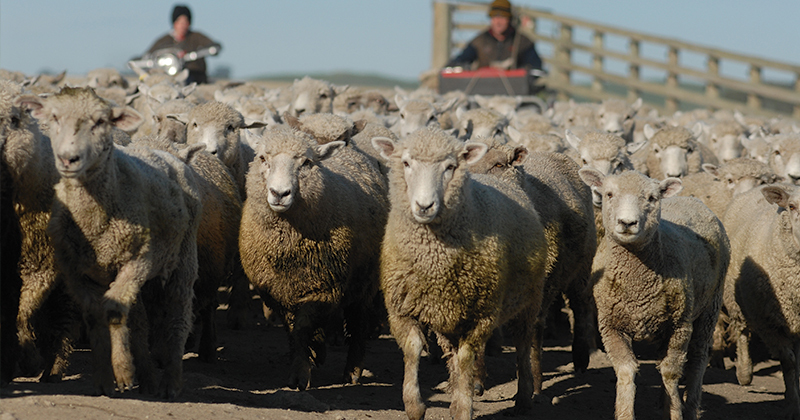 There was more action in light lambs, with the National Light Lamb Indicator losing 10% and hitting 540¢/kg cwt. 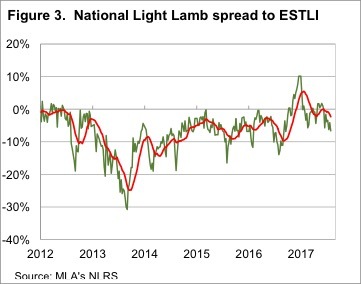 We can see in figure 3 that the light lamb indicator has hit a new low relative to the ESTLI, now at a 6.7% discount, the lowest since last September. It’s normal for light lambs to become more heavily discounted at this time of year, with 10% the lows hit last winter. In the West lamb prices remained strong. The West Australian Trade Lamb Indicator (WATLI) gained 8¢ to sit at 648¢/kg cwt, now easily the highest priced lambs in the country. Interestingly Mutton in WA is only sitting at 390¢, in line with east coast indicators. The 8 day forecast is finally showing some decent falls for NSW, which if falls, will bring sheep supply to a bit of a halt. This is assuming a lot of sheep and lambs have already been offloaded during the dry weather, and the rain gives some optimism in terms of feed supply in the early spring. The could cause a final bounce for sheep and lambs markets, and provide a bit of a boost for those who have suckers which are ready to go.